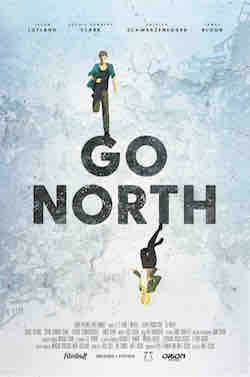 GO NORTH is a problem film for me. On the one hand, taken on it's own terms it's an okay little post apocalyptic film for older kids and nondiscriminating adults. On the other hand the film is awfully derivative and will remind anyone who has seen more than a handful of similar films of all of the films you've seen before. The plot of the film has civilization largely wiped away. We don't really know what happened except we see fragments of newspapers suggesting that there was some sort of epidemic and collapse of order. In a small town somewhere in the American South Josh lives alone and dreams of a better tomorrow. There are no adults anywhere around. He attends school which is run by a bunch of older boys, jocks. One day he decides to head north to see what is there. TRaveling with a girl named Jessie he soon finds that he is being chased by Caleb and his boys. Echoing LORD OF THE FLIES, not to mention any number of post apocalyptic films or stories GO NORTH works best if you see it as a kind of cinematic equivalent to the Young Adult novels that that seem to flood the market these days. Witty kids are in danger as they travel across an over grown landscape followed by some bad guys. The film seems aimed at the same audiences as THE HUNGER GAMES or MAZE RUNNER films. It's not bad, but odds are you've seen this before- to the extent that I kind of knew what the last bit was going to be before the fade out. That ain't a crime but it just makes it hard to love. I know I would have liked it more had the film's world made some sort of sense. The world is in uneven disrepair- some places are over grown some places are not. How are there batteries for somethings and others not? Why is a street covered with unaged gas masks? The kids are pristine as are their clothes but their homes are all run down. Excetera excetera. Things are so uneven that I spent way too much looking at the mistakes rather than the story. Its sad that the script doesn't work better because the all performances lead by Jacob Lofland, Sophie Kennedy Clark and Patrick Schwarzenegger are actually pretty good. Is GO NORTH worth seeing? If you like this sort of story yes it is. Bonus points if you're of the same age as the characters. All others it's up to you. GO NORTH hits theaters and VOD Friday January the 13th. A special VR short tie in can be found here.